CAST’s first project, installed in 1994, is a larger-than-lifesize bronze sculpture of three renowned Austin writers that sits under a pecan grove at the entrance to Barton Springs Pool. J. Frank Dobie, Roy Bedichek, and Walter Prescott Webb used to meet at Barton Springs every afternoon and hold forth in what has been characterized as "Austin’s first literary salon." The men met on a rock at the edge of the pool that Bedichek dubbed "Philosophers’ Rock." 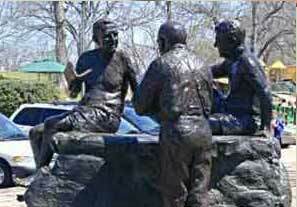 The statue, by renowned sculptor Glenna Goodacre (who created the Women in Vietnam memorial in Washington D.C. and the image of Sacajawea on the new dollar coin) is an unforgettable depiction of three good friends engaged in an informal but intense discussion. A monument to friendship, ideas, the glory of nature and the joy of conversation, Philosophers’ Rock quickly became a beloved Austin landmark. The Austin Chronicle, in naming Philosophers’ Rock the "Best Public Art" in Austin, wrote: "It does what great statues do: recognize achievement, convey a sense of the community from which it sprang, and inspire us." The Austin American Statesman declared it "an irresistable connection to Texas’ literary past."